Hello and welcome to my first blog! As you probably can see, the Posbank is one of my favorite places! 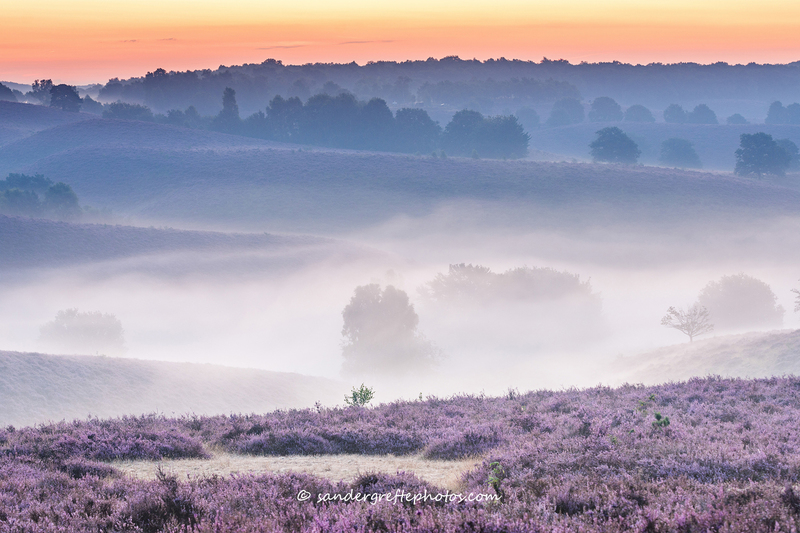 Last year I went a couple of times to the Zijpenberg and one day everything came together: beautiful purple heath, mist, and a magic sunrise. 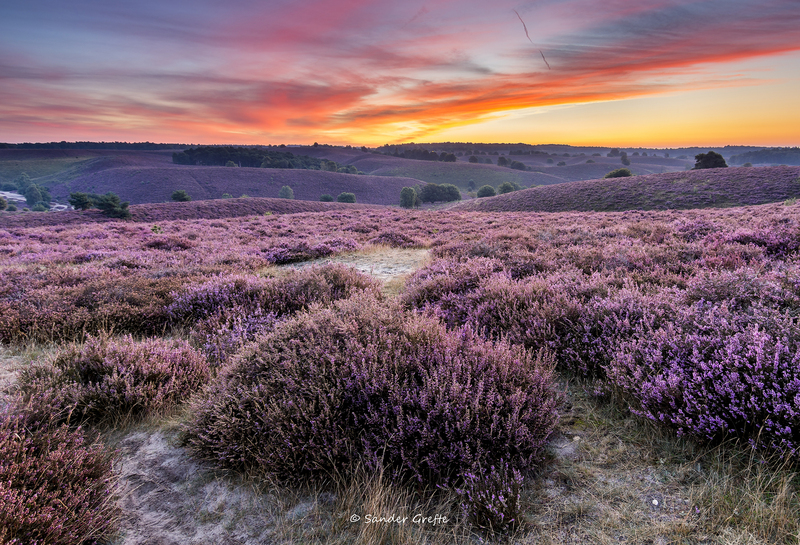 The panorama I made of this moment is one of my best (panorama)photos, which also won the heath contest of natuurmonumenten. As it would be difficult to beat that one, I was thinking of a new project…. it would be nice to see the sun rising and the mist moving, so the plan was to make a timelapse! Below you can see the final result but I hope that you take some time for my short story of how I experienced it. A timelapse… hmmm… what to do… I really didn’t know how to make one and a search on the internet made clear that I needed to use manual settings. But what kind of settings (especially shutter time) do I need? I really didn’t know, so I chose the easy way: Aperture priority, but for post-processing not a good idea as you will get a lot of flickering. Luckily several programs can be used to get rid of that :-). A big advantage for me to go to the Posbank is the distance. It only takes me 5 minutes, so during the blooming period (3 weeks) it was easy to go every morning (if the weather forecast was good) before going to work or in the weekends (before my children woke up). I also knew to which spots I wanted to go to. 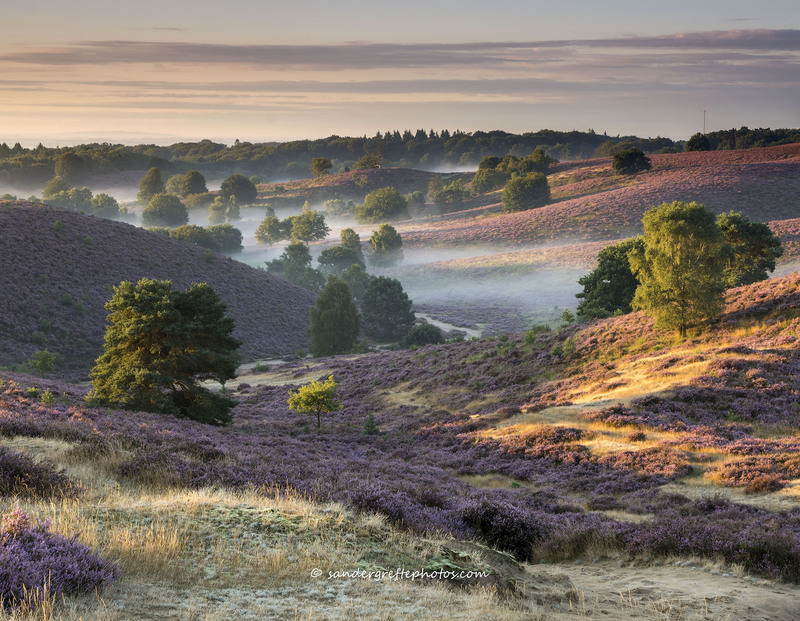 For the first scene I planned to make a complete overview of the Posbank from the Zijpenberg. How lucky was I that during the final morning I had the best sunrise of 2015 (at the Posbank). I also wanted to see the mist rolling over the hills of the Posbank and therefore zoomed in on the landscape. One day the conditions were bad for just a single photo, but really good for the timelapse due to the clouds moving in the sky. 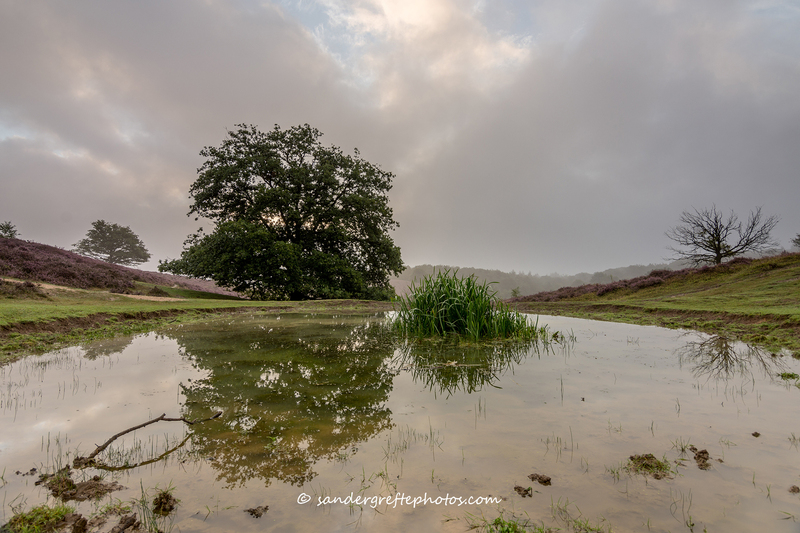 I directly knew that I needed to go to the small pond (of which I saw a picture from another great “Posbank” photographer, Peter Bijsterveld) for the reflections of the moving clouds. One of the best point of view of the Posbank was new to me, the Zandklep. I already talked to a second great “Posbank” photographer, Dave Zuuring, and after seeing his picture it was clear to me… This is the best spot to visualize the rolling mist through the valley and the moving shadows when the sun rises. It is really beautiful to be here all alone without any other photographers and watch how the landscape changes!! The movie ends with the classic view from the look-out point where the actual Posbank-monument is located. Here you can nicely witness the sunset. Now the whole process of making the time-lapse was amazing. As the camera with the remote (interval of 4-8 seconds) did all the work I had time to actually really enjoy the scenery and looking at other photographers stressing to find the best composition especially during the moment the sun is rising :-). Will I do it again? I don’t know… I did like the free time during the moment and I met many other photographers, but the post-processing takes many hours of work and is difficult, especially setting the white balance for the whole sequence (either very blue in the beginning or red/orange at the end of the sequence). Also the de-flickering process costs a lot of time. So I am not sure what I will do next year, but I will definitively go back!! Well, a message for the professional (more experienced) timelapse makers, I hereby challenge you to make a time-lapse of the Posbank as well as it deserves more of these movies!! For now enjoy and feel free to leave a comment or share :-)! What a great first blog, congratulations Sander. Can’t wait for the following blogs, but this first one is stunning and will be very hard to beat. Agree with Peter, amazing work! Mooie eerste blog, met inspirerend fraaie foto’s. Maar de topper is natuurlijk het time-lapse filmpje, super! Bedankt Wouter. Het hoogtepunt is inderdaad het filmpje! Dank je Marjanne! Het is zeker de moeite waard om het een keer te proberen, maar het kost best veel tijd. WAUW!!!!! Sander, strak man! 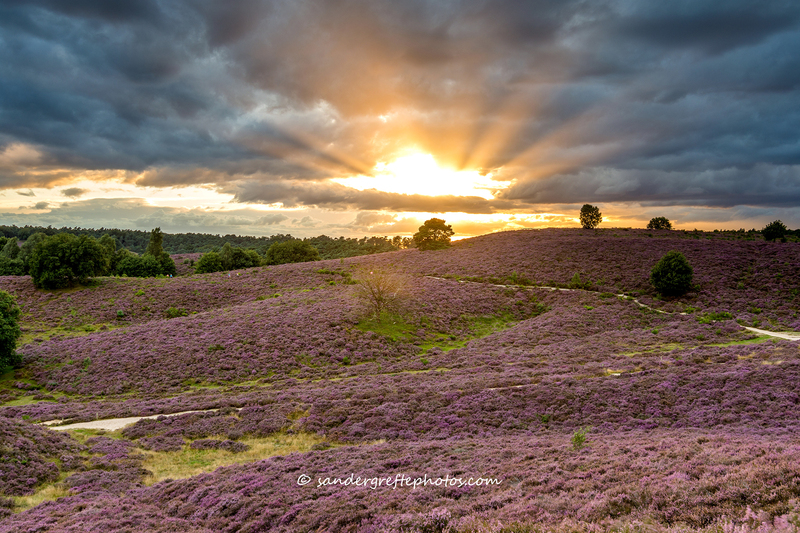 Mooie foto’s, maar wat een geweldige TimeLaps!!! Waar een artikel in ‘Resource’ toe kan leiden. Zo heb ik je website ontdekt. Wat een prachtige foto’s Sander. Vooral de Posbankfoto’s spreken mij erg aan, ik ben in Rheden geboren en in die omgeving opgegroeid. Ik ga je blog volgen…..